These results show good consistency but note that all give readings that are .002" less than the Waara V-block and the Mitutoyo gage with 60° anvil. The best tools are clearly the Waara V-block and the Mitutoyo dial gage with 60° anvil. Almost as good and entirely adequate for our purposes is the dial height gage. Any of these three can be regarded as giving the true size of the strips. 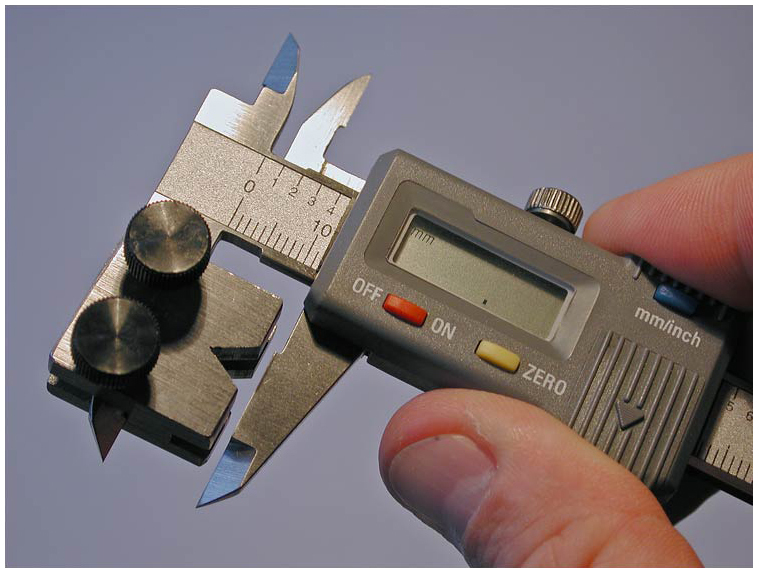 The micrometer and dial caliper are not acceptable. Apart from the apex being crushed by their measuring forces, one cannot plane a perfect apex in bamboo. The resulting measurements will always be too small and strips that are consistently .002" under as shown above will produce flat-to-flat measurements .004" over the intended dimension. Keep in mind that adding only .005" to each station in a rod will result in that rod requiring one larger line size. 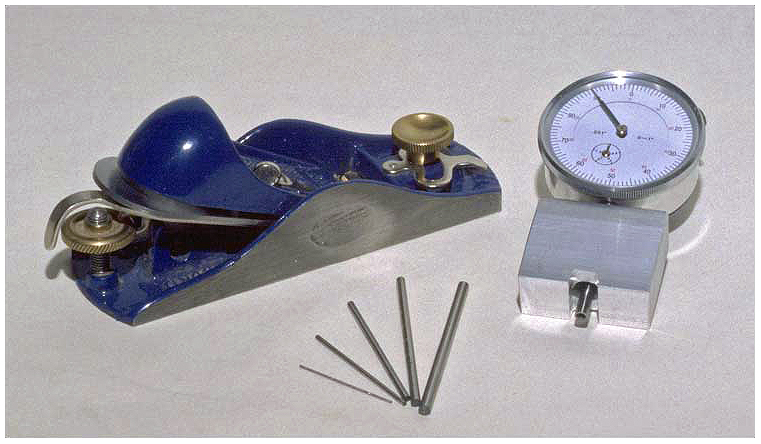 A plane, a dial gage and some drill blanks are all you need to both set planing forms and measure strips accurately. Here is an economy dial gage fitted with an aluminum base which has been drilled for the gage stem and drilled and tapped for a set screw to fix the gage to the base. The bottom has been notched so the base can sit over drill rods for setting your form or over a strip for measuring. Discard the contact point that comes with the gage and use the end of the spindle. Total cost of gage, material for base, and drill blanks--less than $25.